It's been a while since we've given voting an overhaul, so we've decided to implement a few new rewards and voting features. If you've got any suggestions for voting or have any questions on the update, comment them on the thread! In addition to this, we're introducing new voting and vote party rewards! You will receive all of the below rewards when you vote for the server. You can do this three times a day. From now on, during Vote Parties, all online users will be given the below rewards. The Vote Jackpot is a new way to earn money by voting. You will be entered into this jackpot each time you vote, meaning you can be entered three times each day. The Jackpot will roll once each day. You will be able to execute /vote jackpot to see the possible rewards from each Jackpot draw. The rewards from the Jackpot could be spawners, boss eggs, minion spawn eggs/upgrades, valuable blocks, money, ranks, and more. Make sure you vote to enter into the daily Jackpot! We're introducing a new system that allows you to claim free, daily rewards by voting. You can claim these rewards through /vote profile, and then click on the days that you have voted to claim. You must have a Discord account synced to use this! If you miss a day of voting it'll reset you back to the first reward, and there are 21 rewards to win in a row. If you get to the end (and win the best prize available) then you'll be set back to day 1 and can start from the beginning again! 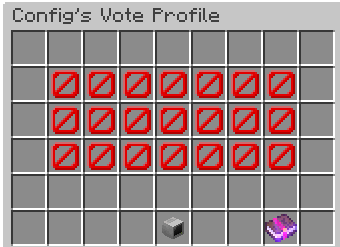 So, we hope you enjoy the new vote features! They'll be deployed live to realms over the next few days! So many exciting things coming out, can't wait for more! Great addition! Is there already a date set for the new features implementation? Excited to see it lmao, players will feel more entitled voting. If I vote 3 times in a row will it stack to be a 15min boost? & Will it stack with the Outpost 1.4x boost?